If you live around Silicon Valley or any of the surrounding areas of Northern California, and you suffered an injury or lost a loved one as the result of someone else's negligence or wrongdoing, you can turn to the Hann Law Firm in San Jose for the aggressive advocacy and personalized support you need. Our law firm's founder, attorney James Hann, has more than 18 years of legal experience and a varied background that makes him well-suited to handle your personal injury claim no matter how complicated your situation. Over the course of our history, we have recovered tens of millions of dollars in settlements and awards for our plaintiff clients, including a recent landmark $40 million judgment in a wrongful death case. This success has helped earn our reputation as one of the region's leading personal injury law firms, and we promise to fight hard to help increase your chances of securing the full amount of compensation for your injuries and losses. Dedicated to your needs, we promise to always work closely with you throughout all legal proceedings, and we are always available to address your questions and concerns, and to deliver the individual attention your case deserves. 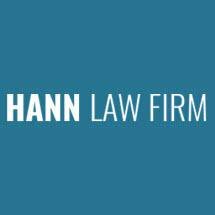 To find out more about how the Hann Law Firm can best serve you and your family in your time of need, you can call our office or visit our website to schedule a free initial consultation.